This practice has, for obvious reasons, angered a lot of people. In some cases it has caused a backlash against those companies. For example, in the Sony Ericsson case shown above, the local community of Buckhead, Georgia – the Atlanta suburb where Sony was building their new facility – threatened to rescind a deal they made with the company which included $4 Million in tax credits when they learned of this hiring policy. 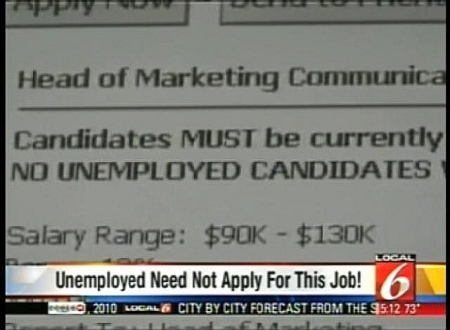 (Sony subsequently removed the ad, saying it was “a mistake.”) In other cases, when reporters called companies who posted jobs with restrictions against unemployed applicants, those companies removed the ads – obviously to avoid negative publicity … but we can only assume that their discriminatory hiring practices continued behind closed doors. So why are today’s companies now doing this? At a time when there are more unemployed job-seekers out there than any other time in recent history, why would any company eliminate from consideration such a huge pool of talent … potential candidates, many of whom are probably just as qualified (if not more so) as anyone who is currently working? Without trying to justify it, or in any way condone this practice – as a recruiter who has heard these preferences expressed from client companies I’ve worked with myself, I can probably shed some light on their thinking. One reason might be expediency. Every job posting now brings in an unprecedented flood of applicants. Company recruiters and HR people are completely overwhelmed with literally hundred and hundreds of resumes for each and every job opening they advertise. By eliminating unemployed applicants, they are whittling that number down to a more reasonable group of people that they can screen and interview in a more efficient and timely manner. Another reason is perception. It’s basic human nature to view a candidate who is still working in a better light than an unemployed job-seeker. No matter what the true facts are, there is always that irrational but nagging suspicion that someone is out of work for “performance reasons.” It’s not logical, and it’s not likely to produce a higher caliber employee … but it is the way many people think. Trying to understand the reasons that companies do what they do in their hiring practices can be useful information for any job-seeker in determining how to position yourself for the best chances of success. If the name of the game is perception, then it’s up to you to create a perception that will be most likely to avoid being eliminated before you even get to the starting gate. Don’t give companies any reason to overlook you before they even talk with you! Use this information, and my suggested strategies, to get past the irrational screening process. Your goal should be to advance yourself to the interview stages of the hiring process where you have the opportunity to impress people with your actual talents and skills, your positive attitude and your passion for your work. Entry filed under: Advice for Job Seekers. Tags: interviewing, job-seekers, resume. Wow. I had not heard of this trend, and I find it disturbing and short-sighted, to say the very least. Fortunately, the situation doesn’t (currently) apply to me, as I’m not unemployed or looking for another position. But I certainly know a LOT of bright, hard-working, savvy engineers who have been hit by layoffs in the past couple of years. In my opinion, any employer who is willing to ignore this talented pool of candidates simply because they want to feel proud that they’re able to recruit employees away from another company is making an incredibly stupid business mistake! NIce, Michael. I tweeted this one. Have a good day. Thank you for validating what I’ve told job seekers to do since the 90’s and that is to fill in the gaps with experiences such as volunteer, self employment, etc. Although this practice of only hiring those already employed has been taking place for some time, we are now seeing it used more frequently. It’s important for job seekers to not take it personally even if they know they were the only one in the world that was a fit for a job, chances are the hiring powers never even looked at their qualifications but simply looked at the date they last worked. We all know these companies are dealing with a huge volume of resumes but honestly they are screwing themselves when they don’t take the added time to filter through the qualified, experienced, perfect fit applicants. Michael.. you are correct in that companies can require that the candidate must be employed. The challenges of today versus in the past, where companies believed that the employees were downsized because they were not top performers and today that is not an accurate statement. Today,It Takes A Village ! Great article. It doesn’t hurt to temp as well, it shows that your still being active while enhancing your skills until you land that job. Actually, temping is one of the biggest mistakes a job-seeker can make. I did this out of desperation after college, and have been openly told that I looked like an unstable worker because of it. Most people would assume that it makes you look willing to do what it takes, right? Wrong. I don’t know who told you that doing temporary contract work is a mistake – but that’s really bad advice, and is flat out wrong! Staying involved in your field through short-term contract consulting jobs is WAY better than not working at all. Any potential employer would rather see a job history filled with short contract jobs (especially if they are in your industry niche) than a long unexplained period of unemployment. Contract jobs are, by definition, short-term assignments. How does that make someone look “unstable?” Whoever told you that is sadly uninformed. If it was a recruiter, run the other way and keep working! I’d have to agree with Angela. I’ve been experiencing the same issue as I’ve only been able to secure temporary work, even though it’s been long term (at least 1 year each contract). Every recruiter and even HR and hiring managers don’t understand why I have been working contracts for so long. I’ve been through several layoffs with pretty much every company that I’ve worked for, and the company I currently work with is shutting down its operations. My manager is offering to convert me to a permanent employee, however I do not really see the benefit in this as I would only have this job for a few more months! I’ll say it again: Working is better than not working. Sure, a permanent job trumps a contract position … but nothing looks worse on a resume than a long gap of unemployment. If contract jobs are all a person can find, it would be foolish to turn them down in hopes of finding a perm job later. Any reputable recruiter or HR professional should know that, and see the logic in it. Definitely disheartening. Evidently the extra tax incentive approved by Congress to hire those unemployed greater than six months is no incentive to these folks. All of those possible scenarios you’ve cited are perfectly reasonable, Michael. But the real perception all candidates (both employed and unemployed) need to embrace here is that in all likelihood, companies that advertise for ’employed people only’ are not going to be great places to work anyway. It’s a form of corporate eugenics and those sorts of agendas always result in inbreeding and deformity, eventually. Mitch: an elegant statement, “a form of corporate eugenics and those sorts of agendas always result in inbreeding and deformity” as well as prophetic – time will demonstrate it for us. … an emerging class of “untouchables” … for whatever reason … an inwardly negative, spiraling cannibalism? How to break the cycle? Or do we wait until everyone employed has stopped the musical chairs and we build more? Or like Michael suggests, we can go ahead and build our own chair and see if anyone wants to buy? Maybe the smart recruiters will actually seek out the best of the unemployed to supply and contrast them “in addition to” what the client asked for … you’d have to think that the unemployed group would have something worthwhile going for them … like being extraordinarily motivated? This is sadly not news, as I think we have heard this filtering around the recruiting community. It does highlight the fact that recruiters don’t have the level of sophistication or automation that is required to sift through applicants. Resume’s are a poor source of reference. ATS, as sophisticated as they are, do not do a good job of sorting the wheat from the chaff. Recruiters need to update their arsenal off tools and fortunately there are tools available. http://bit.ly/dbTZJg for instance is an automated reference checking system. This cuts down on hours of phone work and gets impressive response rates. That said your advice for those out of work is sound! Thank you for the article. I find it disturbing, but not unexpected. It appears that industry is killing itself from the inside out. Being a part of CVP, I have seen the talent pool that is currently unemployed and what company’s with this practice are passing up! I am part of a long thread where this topic is well aired in the UK (700+ posts so far). Even the recruiter try to divine ages before finishing the CV. It is illegal in the Uk to age discriminate but it happens more often than not. Add unemployment to that long list! Job seeking is one of the toughest tasks because one needs to squeeze thru hundreds of hundreds. Sometimes it is very humiliating for those who are over 45. I think Michael is right. You don’t need to lie to get a job: however, you can use arsenal of tricks (ideas) to get a position. In the world of outplacement consulting working with those who have lost their positions and are unemployed, the advice is to keep job search and networking activity levels high and to use a proactive strategy. Know what you are looking for and be able to communicate it to recruiters and networking contacts. Volunteering, working part-time, etc., are all good ways to keep a pulse on your industry and keep connected. Be as active in your search as you were on the job. Interviewers will gain a more positive appreciation of your skills and motivation. Once re-employed, the advice is to keep your skills high and prepare for your next career move and make it your choice this time instead of someone else’s. This is not totally unbelievable, but it is strange in my opinion. Especially because the government is giving tax breaks to employers hiring unemployed workers. While the recently unemployed may be so for reasons having little to do with their abilities in their profession, those who have been long unemployed might reasonably be looked upon as a pool substantially less likely to yield high-performers. If they have been long unemployed, then either they have been unable to interest many other employers or they have shown a lack of initiative in creating their own job by starting their own business. As an employer, I would surely want to see that the business they set up does show some creativity and hard work toward getting it going. I would be leery of hiring someone who was willing to be long on the public dole. It indicates too great a sense of entitlement and too little pride. The many extensions of unemployment insurance may be doing many people no favor. I am hearing of surprising cases in which employers are looking for people to hire, making offers for interviews, and seeing no one show up for the scheduled interview. I wonder if the trend also applies to potential candidates straight out of college or training schools – or even those who have left the military. Charles … exactly what planet do you come from? How dare you insult the long-time unemployed that way. Do you friggen think they want to be unemployed? Charles … You made them sound like bums that want to be on unemployment. Whose KoolAid are you drinking? I have worked with the unemployed since the early 90’s and I will tell you I have never, ever seen so many highly qualified people from so many different industries unemployed as I’ve seen in the past 2 years. These are people that worked for one company for 10-15 + years. They were respected, hard working professionals that were totally loyal to the companies/corporations they worked for. Now unemployed they are working their asses off looking for work. They don’t want to be on unemployment … anyone that thinks that way is totally not understanding what the face of today’s unemployed is. Charles … when was the last time you visited a job club in your area? Maybe you need to do so. Or join my online job club and talk with the 1,700 members on there as I’m sure they would love to help educate you on just who is unemployed these days and what it means to be unemployed these days. And, nice of you to spout about some company that is hiring but supposedly no one showed up for a scheduled interview. You would need to give a whole lot more information for that one to be believable. And, my last comment to you is NOT EVERYONE CAN BE AN ENTREPRENEUR!!! A mistake in your assumptions: not everyone unemployed is on the public dole … there are some who refuse to accept it on the grounds of their personal integrity (and not wanting to contribute to the problem of increasing our progeny’s tax (read: social) debt. And the same for healthcare. Given your obvious vainglory and near complete incapacity for critical discernment – it is clear that “safe” also means “lacking integrity” (by your own logic). & @Maureen … you go! Right On! What I find frustrating is that some employers don’t care that the unemployed are attempting, keeping their skills current or have returned to university to further their education. I had one employer ask in a phone interview what I had been doing since becoming unemployed. It was not enough that I had a temporary position, received another degree, and continue to volunteer in the community at a science center. The response was “So you are not interested in a position”. Ryan: Your answer is just fine. That particular employer sounds ignorant. You probably wouldn’t want to work for such a person anyway. Keep plugging away. There are plenty of other more intelligent employers who would appreciate your working a temp job, furthering your education and doing volunteer work – all worthy endeavors. This is very common in the UK. I was made redundant 6 months ago, at first my CV included this fact, and I had very little interest while applying for jobs. I therefore removed the face, and updated my work history to just include the start date for the role in which I was made redundant. Instant suscess, offers of telephone interviews and face to face. One problem though, I am getting used to the phone being slammed down on me once the question is asked. One well known IT organisation got 60mins through a telephone interview, was impressed enough to book me a face to face interview, and once I confirmed the date, asked me my availablity to work. I soon as I said now, they asked why, the second I mentioned unemployed, as if by magic the role had been filled in that second by an internal candiate. I’ve had 3 office based interviews terminated early as soon as the question is asked. Two of them I’d travelled for over two hours at my own expense, and put aside a day. The best one was being escortted from the building by security, as there was an apparent increased risk due to myself being unemployed. I now answer the question in telephone interviews, as simply, I am a self employed consultant considering taking on a new contract or permanent role. On application forms, I tick the 2 or more weeks notice box. Thank you, Sir, for sharing these Skype Interview Tips. It IS illegal now, in some states. Check out SHRM article. Cepero works for the national human resources association, yet was ‘unaware’?! Sure…. The fact that any HR ‘professional’ has to be advised on the discriminatory practice of hiring only ‘passive’ candidates, is obscene and shameful.